" She was the heir of ash and fire, and she would bow to no one. The king's assassin takes on an even greater destiny and burns brighter than ever before in this follow-up to the New York Times bestsellingCrown of Midnight. " I finished HoF about 20 minutes ago. Why did I wait that long until I wrote a review? Because 20 minutes is about how long it took me to stop screaming. This book DESTROYED me. 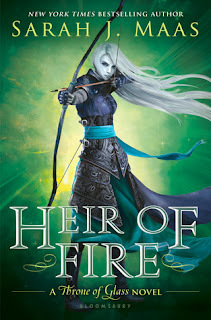 Sarah J Maas is one of the best writers I have ever come across...EVER. I'm not particularly sure why I waited this long to read HoF considering I went to one of Sarah's signings a few days after it's release in September of last year. I thoroughly enjoyed Crown of Midnight and I couldn't wait to see what happened in the continuation of the series. Maybe it's because the size was intimidating or maybe it's because I was just too lazy to go out and get it from the library. 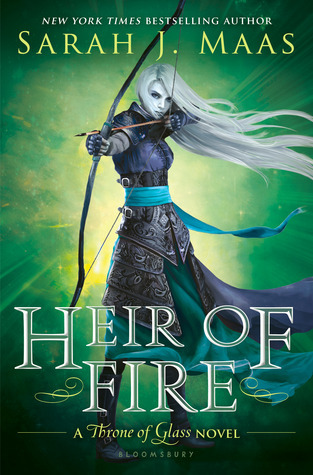 However I am grateful that I waited until the month before QoS releases to read HoF. I don't think I could have waited another year to find out what happens to Aelin, Rowan, Aedion, Dorian *cries hysterically*, and I guess Chaol. So much happened in the final chapters of this book it was hard to take it all in. Let me just talk about the ending first because I need to let my thoughts and feelings roam free. THE KING MUST GO. That ending scene where he brings Sorscha, Dorian, Chaol, and Aedion to his council room. UGGGGGG. It was so obviously a trap yet every single one of them fell for it. I was whisper-screaming, "Shut up! It's a flipping obvious trap so stop giving him all your information!!!" the entire scene. I was mad at Aedion for blowing his cover, I was mad at Chaol for attempting to stand up to the king because it obviously failed horribly, and I was screaming by the time Dorian USED HIS MAGIC. Me: THAT'S WHAT HE WANTS!!! Me: DON'T YOU DARE PUT THAT ON MY BABY!!!! Me: SARAH I DON'T UNDERSTAND. WHY?!?!?!? After that traumatizing scene the POV switches back to Chaol. Of course Chaol gets out of things JUST FINE. I'll admit that I'm a little irked that things have gone pretty good for Chaol, at least compared to everyone else. Dorian, Aedion, and Sorscha sacrificed themselves yet he's still walking around unharmed. I am definitely not Chaol's biggest fan. I never shipped him and Celaena, sorry Chaolaena shippers, and I couldn't really get into his chapters. I honestly have no idea where the disinterest in his character comes from but I can't help but feel this way. You know who I do have an interest in, though? Rowan. My love for Rowans character in never-ending. It was interesting getting to see him and Celaena interacting. Mostly because Celaena didn't know how to handle her Fae form and Rowan was there to "help." Yes. He was a douche at first but that's because he's broken inside and he doesn't know how to handle his feelings. Is that an excuse? No. But I also think he was scared of getting attached to anyone because he had already lost so much. Ok now I'm just making up excuses. There was definitely some major character develop in a lot of characters. Aelin specifically developed MAJORLY. Think of major character development then think bigger. It was stunning to watch Aelin overcome some of her greatest demons so she could eventually rise victorious. Like a phoenix from the ashes. Though it wasn't as much as a spectacle as Aelin's was, Rowan definitely went through some character development. It wasn't particularly shown but he just had an almost renewed feeling to him at one point in the story. Like he hadn't quite given up yet. Though we didn't see much of him, Dorian also went through some character development. I think that part of it was definitely thanks to Sorscha. She brought out the best in him even when the worst was trying to rear it's ugly head. Now moving away from character development let's discuss the Iron-Teeth clans. I had a blast reading about the Iron-Teeth clans. They were dark and violent but inexplicably intriguing. One is dominant and the rest listen, obey, and don't question anything if they know what's good for them. I was kind of getting a "How to Train your Dragon" vibe from the whole Wyvern training situation except with a lot more death and violence. I could not for the life of me tell you what a Wyvern is. Is it a dragon? Is it a bull with wings? I don't know. The food. What is wrong with the food that was being served to the clans? I have a feeling that it was some type of poison that allows the king to dispose of them once they've fought his battles. Maybe in a future book all the other clans will drop-dead and the king will have a nice surprise waiting for him once he finds out that the Blackbeak clan is still living. As much as I hate the king, I would love to read about his upbringing. Why is he so evil? Did he have an extremely traumatizing child hood? Did his parents drop him on his head a few times? Has he always been this way? HOW LONG HAS HE BEEN PLANNING HIS DESTRUCTION OF THE WORLD?!?! I probably haven't even covered my thoughts on half of this book but you know what? That's okay. I still don't think I've fully recovered from finishing this book because it's so AMAZING. This is one of those books that's so amazing you can't even come up with words to explain all your feels.